My interpretation is that so far Crytek has a pretty strong position. CIG seems to be trying to win on technicalities and I would be surprised if this doesn’t move to discovery. Wish youtube saved the chat, there was some funny stuff in there. A lot of the response’s language seems to weaken the original allegations further, things they were claiming were contractual are now claimed promises that only existed exterior, those are things that would need to be unearthed in discovery. Intentionally making hard to prove claims is part of the strategy for making sure it doesn’t get thrown out here. It seems likely that in discovery crytek’s other contracts and the interpretations of those contracts will come into question, those contracts will probably be similar since this is a standard GLA, and their more long-armed interpretations aren’t likely to stick. RSI is mentioned in the Autodesk license and nowhere else, talk about trying to win on technicalities. They’re still pushing contradictory claims too, they insist they aren’t using the engine but say that their use of the engine is copyright infringement, simultaneously that they should have used their trademark on a different engine. Supposedly faceware had access to an engine crytek says CIG switched to yet simultaneously faceware’s access to public lumberyard code is supposed to be a breach. Trying to approach the same case from conflicting angles simultaneously probably wont go over well with the judge. 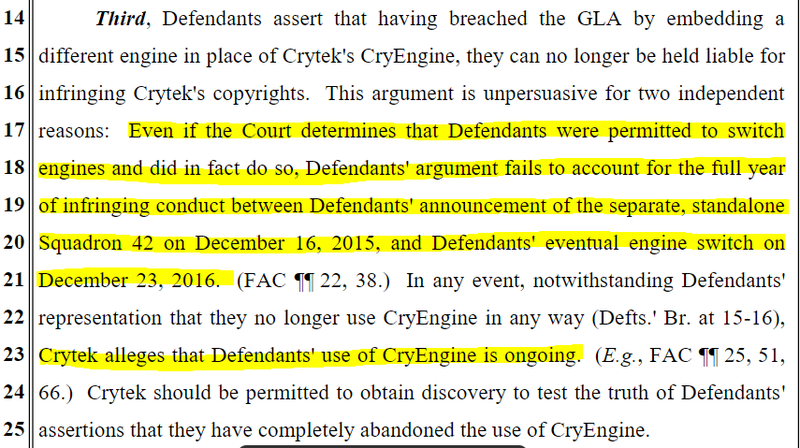 Not withstanding that I think Crytek’s arguments won’t hold weight in court, I don’t see them as being contradictory. I see them as maximizing their position/argument to enforce that most of their claims will make it to court. I think it’s what people suspected all along. They’re trying to make the most argumentative case possible, which will in turn drag the court case out for as long as possible, making it as expensive as possible, which will give CIG/RSI ample reason to settle out of court. It ends up being cheaper to settle than to fight it. Also known as "throwing mud at the wall to see what sticks. Too bad they didn’t just build their own engine… Like a certain space battle simulator that is currently in development run by a small crew of people off of a modest kickstarter effort. I’m not convinced that would have worked any better under the leadership of Roberts. All the lawyers I’ve seen look at this case including french seem to think CIG’s claims are much stronger and make sense in the context of both the GLA and common interpretations of engine licensing law. Crytek’s interpretations are fairly absurd and the response illustrates many of those points. Feb 10, 2018 update - The judge decided to not hear oral arguments. Feb 28th, 2018 update - Crytek filed a notice in the Star Citizen case. March 9th, 2018 update - CIG filed a protective order motion with the court. (Scroll down to March 9th update). March 10th, 2018 update 1, and update 2 (scroll down to March 10th update). March 27th, 2018 update (MEMORANDUM in Opposition to MOTION for Protective Order) - CryTek have filed their answer to the Mar 9th filing for a protective order by CIG. April 3rd, 2018 update - CIG filed a response to the 03/27 filing by CryTek. An unbelievable response. April 17th, 2018 update - The judge denied (as moot) the PO filing - Discovery must proceed. I wonder If they created that pack for the lols or think someone will buy it. The situation developed as it did, because Crytek slacked off during translation of their original GLA (which I presume to have been worded in german lawyer-nese) into english, which led to some of the translated points changing their meaning. Add to it a different understanding of copyright laws / completely different copyright laws from the get-go (those things that have been regarded as common understanding in copyright multiple times might not be so common in german copyright)… I would love to see if there is a proto-GLA written in german. But yeah, that’s just my own little take on the thing, only a couple of months late. Guy wrote another thing - now updated . And a little more on twitter. ‘faking atmospheric burn, who knew?’ to quote the guy above who wrote the thing. John Pritchett*, Ph.D, the lead who has been working on the flight model, the physics etc, just announced his exit from the project. - And released his IFCS model before he left - here. He has been replaced by a jnr dev, Dave Colson, who’s only worked on basic FPS games. That paper is music to my brain. Thanks Johnny! Literally bashing my head on the keyboard this weekend while tweaking out the bugs in my own 6dof. Trying to convert it from Earth focused to orbit focused is annoying. Maybe I’ll post it in the personal projects thread later. I know we’re looking at one side of the debate here, but I’ll be amazed if Star Citizen ever works/releases/succeeds. It’ll be much less surprising if I walk downstairs tomorrow and find my hamster has turned into a teeny-tiny parrot. 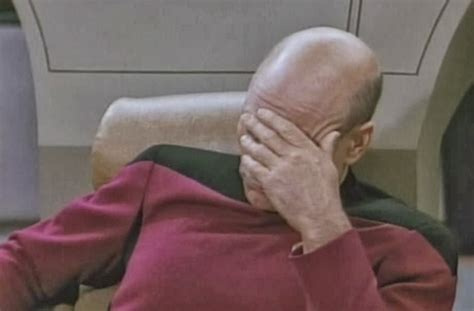 In all seriousness though, I don’t understand what the Star Citizen dev team are thinking. Feature creep (more than I’ve ever seen), missed deadlines and floods of refund requests would surely ring alarm bells in their heads. It’s become a bloated concept that I’m not sure anyone really knows what to do with any more. I am not totally convinced it’s deliberate (as DS seems to be), but even if it’s not, it’s an awful way to run a game development cycle. On the bright side, it leaves less for Infinity: Battlescape to contend with! At least I-Novae have a clear goal, haven’t strayed from it, and have a remarkably playable Alpha! Did anyone of you played recently? This alpha could nearly be considered a finished game it’s over. Interesting analysis on CR’s transcribed statement.